"We now realize there is only one ocean, the world ocean." Thousands of golden jellyfish glide through the crystal-clear waters and create a striking visual image. Swimming casually within the middle of the possibly frightful creatures is marine scientist Laura Martin, who initially is completely hidden behind the large group. Luckily, we quickly learn that these jellyfish have lost the need to sting and now serve as farmers. Another pivotal question concerns how these thousands of jellyfish form a complex migration pattern while lacking eyes or a brain. Martin and other scientists aim to answer this question, and their work provides one of numerous riveting moments in The Living Sea. This stunning IMAX picture from Greg MacGillivray represents yet another entry in a long series of successful releases from industry leader MacGillivray-Freeman Films. Originally released at science centers, museums, and other educational institutions in 1995, this film presents the majesty of the sea in all its fine splendor. Flying above the very green islands of Palau, we observe the transparent waters of a place unknown to many viewers. This land's reefs contain more species of marine life than anywhere on Earth and also provide a protective shield for the organisms. The underwater photography of the scuba divers is truly remarkable and offers a surprising level of clarity, even on a home television. Possibly the most impressive shots occur on a Coast Guard vessel navigating the 15-foot waves at Cape Disappointment off the coast of Oregon. These seas can drop more than 200 tons of water on a boat, and we receive an up-close feeling of facing these monstrous swells. Waves also play an effective role in the surfing footage, which hearkens back to Greg MacGillivray's early film work in the 1960s. The melodic tunes of Sting play in the background while the surfers ride the gargantuan waves. I'm not a big fan of the acclaimed musician, but his music does work for this type of IMAX picture. Meryl Streep provides the narrative overview, and she brings the proper regal tone to the images. 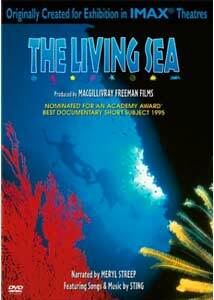 The entire 40-minute production of The Living Seas injects the positive message of caring for our marine environment. Corporations and governments continue to slide around regulations and aim for large profits. While rarely providing any direct statements, MacGillivray promotes marine protection in an entertaining fashion. Nothing is too heavy-handed, and the story provides an enthusiastic picture of waters around the world. One drawback of this film is the lack of as much human involvement in the story. Dolphins and Journey into Amazing Caves provided interesting figures who connected the natural world to actual people. It happens a few times in this movie, but those moments takes a backseat to the colorful images. Of course, these types of shots thrive in the IMAX setting, and the translation to home video retains the enjoyable presentation. Image Transfer Review: The Living Sea may be viewed in either its original 1.33:1 full-frame transfer or an 1.66:1 anamorphic widescreen transfer. The second option provides a much clearer picture and retains the initial colors much better than its companion. While it cannot possibly compare to the theater atmosphere, I cannot image a much better presentation for home viewing. Audio Transfer Review: MacGillivray Freeman's IMAX releases always seem to offer the best audio presentations possible, and this one is no exception. Viewers may choose between a powerful 5.1-channel Dolby Digital track and an even more complex DTS version. The numerous water sound effects ring effectively from all the speakers, and it helps to create a more intimate experience. Extras Review: This release includes an extensive making-of documentary that runs nearly as long as the original feature. We follow Greg MacGillivray, editor Steve Judson, and numerous other crew members as they struggle with the elements to craft and effective picture. This piece basically follows the chronology of the film and provides background details about all the memorable scenes. I enjoyed the honesty of all the players to describe a moment that was staged and to mention any other problems. This type of supplement avoids any promotional back-slapping and really offers interesting background material. This disc also contains a seven-minute overview of MacGillivray-Freeman Films that's basically a commercial for all their movies. It does give some nice background on the director, but the overall effect is minimal. The remaining supplements include four theatrical previews, a biography of Greg MacGillivray, and a second disc for Windows XP users. The trailers exist for this film, Dolphins, The Magic of Flight , and The Stormchasers. The second disc offers the film in high-definition video. I do not have the capabilities to view this presentation, so I'm unsure if the differences between the formats are major. The Living Sea obviously plays much better on a multiple-story IMAX theater, but it still works effectively on the home screen. Supported by a decent collection of extra features, this film is a worthy purchase for viewers interested in the marine world. Hopefully it will draw some novices into the fold who will strive to save this environment from destruction.